We had a skinboat rendezvous yesterday in Alameda. Several skin boat builders brought their boats for review by each other and the general public. Thanks to a notice in the San Francisco Chronicle, quite a few people turned out. Fellow skin boaters Tony Mullins and Dave Browne did much of the heavy lifting. Dave Browne did the majority of the promotional work and organization of the event. I just showed up with boats and brats, that's bratwurst for the uninitiated. I got so busy talking to people and setting them up with boats that I forgot to take pictures except at the start of the event. Oh well. Here's Tony on the left and Dave on the right unloading boats at Encinal beach. Encinal beach wasn't far from my shop so I was able to pile a bunch of boats on top of my car without tying them down carefully. No, not the one in the Caribbean, the one in Northern California. This is where the Arcata crowd paddles. Trinidad Head, a big rock connected to the coast by a low land bridge blocks the prevailing NW swell and forms a natural harbor in its shadow. Here's the view to the northeast and the unprotected beach. If the swell is low, people can take off here with their kayaks. 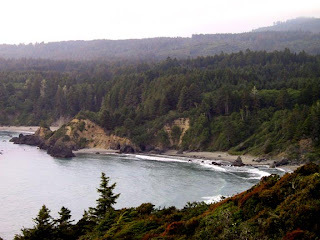 Here's a view southeast, the sheltered water and natural harbor in the shadow of Trinidad head. Here paddlers can launch even when swells are running 20 feet. 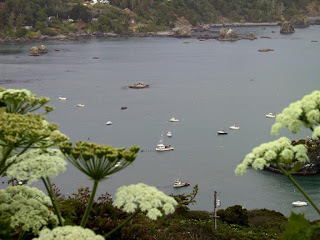 They can paddle sheltered water all day or nudge their way around the corner and push into the swell for big elevator rides or head for the shore for some rock gardening. About the only factors that people typically take into consideration when trying to measure boat stability are factors 2 and 3. 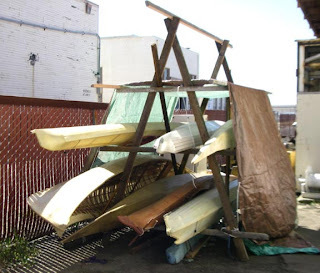 Stability is considered to be a characteristic of the boat and the paddler is victim or beneficiary as the case may be of the boat's inherent stability. 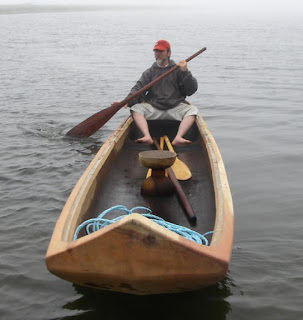 But realistically, the paddler has to be considered a part of the boat since he/she not only affects how the boat sits in the water but is also an integral part of its stabilizing system which may include ballast and cargo, but will also include a paddle. 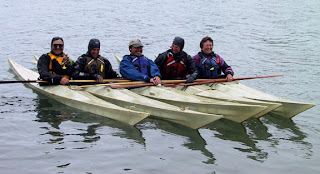 The paddle of a kayak in the hands of a skilled paddler acts like an outrigger and increases the effective width of the kayak from around 2 feet to about 4 to 5 feet, making the boat considerably more stable, so stable in fact that the boat need not capsize except under the most extreme conditions, and if it does, the paddle in the hands of the skilled paddler makes the kayak self righting. 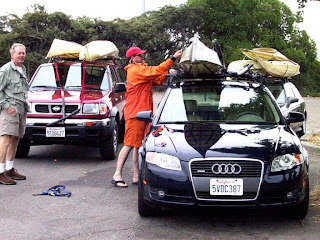 Aside from the skill of the paddler, the second biggest factor that impacts stability of the kayak is its cargo and the weight distribution of the paddler. A kayak by itself is fairly stable. However, a paddler will move the center of gravity upward and make the boat less stable. The heavier and taller the paddler, the worse the effect on stability. The easiest way to counter the weight of the paddler is to add ballast in the bilge of the kayak. According to stability curves published in Sea Kayaker Magazine, ballast has a much greater positive effect on kayak stability than does hull form. 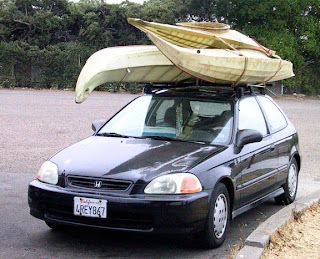 But recreational kayaks on day trips are mostly paddled empty so that stability becomes primarily a result of hull form. The only down side of ballast is that it make the boat harder to propel. Oh well. Finally, there is the matter of the paddler's skill I will return to this topic at another time, along with the influence of water conditions and wind. 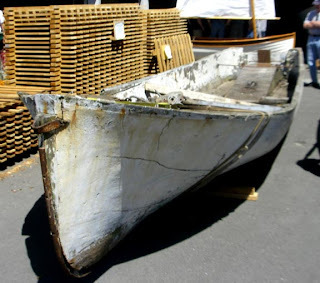 I went up to the Arcata Wooden Boat show in June. Just publishing photos now. Modern boats don't much impress me. I guess it's the esthetics of plywood I'm not in love with. Sure it's practical and easy and strong and low maintenance and waterproof and everything, but it has all the charm of a forest service outhouse. So there were actually a number of boats at the show that impressed me, but here are the two highlights. Appropriately for redwood country, these boats were made out of redwood. This boat was no longer in any shape to use, but it was a local adaptation, probably early 20th century to Humboldt bay. It was carved out of a single redwood log. The log had probably been at least 6 foot in diameter possibly 8. Here's another redwood dugout, this one fashioned by members of the local Indian tribe. I have seen these boats in museums or in photos and they seemed hopelessly ponderous and heavy. Yes they are heavy, but they are not ponderous. They are meant to be river boats and as such have a good amount of rocker and a fairly flat bottom which lets you turn them on a dime. The boat will literally spin on its own axis like a shallow dish. Although the boat weighs about 400 pounds, it is quite nimble and moves along nicely once under way. Plus the center of gravity is so low that you can stand on the gunwales and not tip it over. Sebastian, here pictured jumped up and down on the gunwales without managing to capsize it. Appropriate technology as they say in progressive circles. Here's a handy dandy kayak rack I made out of driftwood. The driftwood happend to be two by six planks of redwood that were floating around the bay. I ripped them and fashioned an A-frame style rack held together with deck screws, our culture's answer to everything, one step up from duct tape. I wanted to lash the frame together in keeping with the construction of the kayaks, but the screws were just easier. The tarp was meant to keep the sun off the kayaks, not the rain. But the setup was only partly successful, mostly because the tarp was too short. I need to work on that. There are also hellacious winds in the area. On summer afternoons, the wind blows about 20mph off the water, then eddies behind the shop and due to some aerodynamic miracle blows sideways at about 30mph which sets the tarp flapping and snapping something awful. 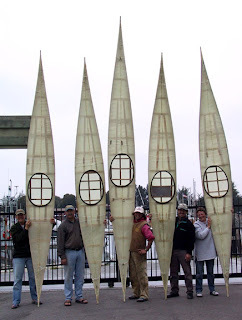 I did a boat building class up in Arcata, CA. First day I got there, I joined some of the local paddlers on the water. 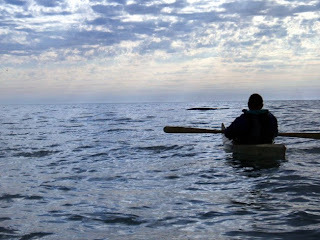 About 15 minutes into the paddle, whales showed up, snorting and breathing deeply and flipping flukes, etc. This was my first whale sighting. No big deal for people on the coast, but my first in 8 years in CA.